"Helping Our Clients Keep the Money They Earn." Our business specializes in the needs of individuals and small businesses. We began our business in April of 1975. We provide accounting & bookkeeping services, payroll services and payroll tax reporting, computer accounting system set-up and training, gambling accounting & reporting, consulting services and any other needs of the small business. 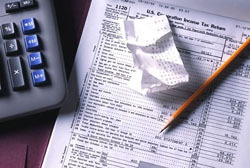 We take pride in our ability to provide our clients with professional tax advice that enables them to comply with federal and state tax laws while paying the minimum amount of tax required by law.